Over the weekend Rino Di Maggio at Self Concept in Italy sends news that he's signed the 29.1m motor yacht Visotta for sale. Built to RINA class by San Lorenzo in 2000 as one of the yard's SL100 series, Visotta was refitted in 2010 with a full repaint of her hull and superstructure but still retains her unusual original English Empire style interior furnishings. Accommodation is for eight guests in four double staterooms plus five crew, while twin 1850hp MTU engines give her a cruising speed of 20 knots. 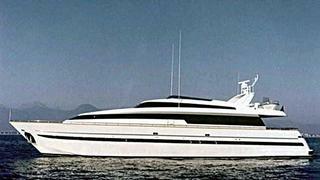 Lying in La Spezia, Italy, Visotta is asking €3.5 million VAT paid.